I recently picked up one of these North Face Apex jackets. It is not necessarily for use while backpacking as much as I wanted it for casual wear around the house and town. Although, this is not to say that I will not use this jacket on any hikes since I do plan on wearing this on some of my day hikes. This jacket is categorized as a soft-shell jacket. A soft-shell jacket is actually a few ideas mixed into one jacket. 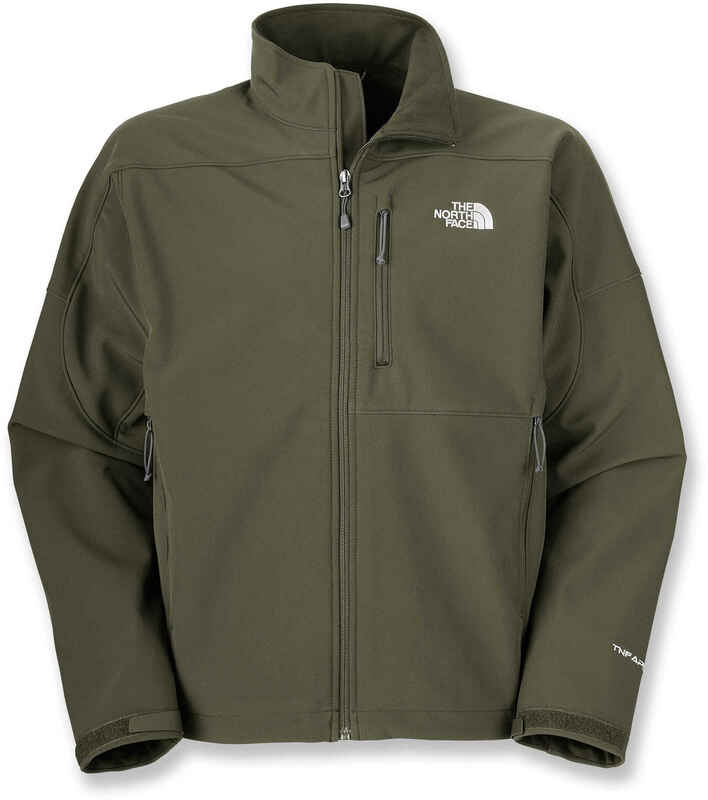 Typically a soft-shell jacket features a thin insulating liner on the inside while the outside will block wind as well as offer a small degree of water resistance. This is actually a great idea, but like any piece of clothing, or gear, there is a place for it. And to add to that, that place is different for each person. I have read through lots of debate about using a soft-shell while backpacking on a few backpacking forums. Some people argue that the soft-shell is a highly versatile piece and is a great piece to use either on its own or as part of a layering system. And then there are others that argue that while the soft-shell has many features, none of them are as good as the real deal, so this “all-in-one” is a waste. “The insulation is not sufficient, the wind block is not great, and the water resistance wets out too quickly”. So, as you can see, there is a lot that can be taken into consideration as to whether or not a soft-shell is right for you. So, while I did not buy this jacket to use as part of my layering system while backpacking, I do feel like this jacket can be a great idea to use on simple day hikes. And then, who knows, it may change my mind and I may decide to use it as part of my layering system. I will just have to see. Like I said, I mainly bought this jacket to wear casually. Before I bought it I went to a local store and tried some on. (I’ll admit that I bought it online, but this was partly due to the fact that the local store did not have the color I wanted, plus I received dividends on the purchase since I ordered it from REI.) I found that the Large fit me well except for around the armpits. The jacket felt a little tight here and I felt that if I wore something thicker than a T-shirt underneath it, it would be a little uncomfortable. Other than this, the jacket fit me great everywhere else, even in the length of the sleeves. Since the Large felt tight under my arms, I tried on an X-Large. The XL fit more comfortably under my arms and it felt like there was enough room to wear a fleece or something under the jacket comfortably. The rest of the jacket was only slightly larger than the large so it did not swallow me like I feared it may. The sleeves are a little long by about an inch, but this is ok since this will keep the sleeves from riding up my arms when I reach up or out. So, obviously, I decided to go with the XL. When the jacket arrived I was so excited. I have actually been wanting one of these jackets for about 2 years. I love the idea of all the different features rolled into one and I think that this will make a great all around jacket, especially for casual wear around home and town. Up to this point I have worn the jacket with a T-shirt and a long sleeve thermal layered underneath and it is a great fit. This system has kept me warm in temperatures as low as the mid-thirty’s. Also, I was able to wear the jacket in a small rain shower and the jacket did a great job of resisting the rain. The water beaded up and rolled right off. Up to this point, I have not really experienced any hard winds while wearing the jacket so I cannot say how well this aspect of the jacket will work out. The jacket is quite thin, but I expected this since I tried some on beforehand. The inner is lined with a very thin layer of fleece. In fact, it is so thin, I would say that it is added more so to provide a softer feel next to skin rather than to add warmth. I have noticed that while wearing long sleeves layered underneath the jacket, the fleece will almost stick to the shirt sleeves when removing the jacket. This is not a problem, but it is a little annoying. The pockets are large, which is great in my opinion. The lining inside all three of the pockets is made of a soft mesh material, which when unzipped, will allow the inside of the jacket to vent. Of course for when I don’t want the jacket to ventilate and would rather keep the warmth inside, there are pull cords found in the 2 hand pockets which will cinch the bottom of the jacket tight around my waist. Also, there is a windflap that runs behind the entire length of the zipper that will keep the wind from sneaking in through the zipper. Then lastly, the jacket has a high collar which when fully zipped up will cover my neck. The jacket features adjustable cuffs as well; however, I am not to sure I like them. I love the idea and glad that this is a feature, but I wish that it was a little different. The jacket uses a hook-and-loop closure to adjust the cuffs. My problem is in the actual adjusting. The plastic hook section is small and stiff, and the loop part can be thick if trying to adjust them much. So, I have ended up closing them only slightly which actually makes it ok too because I can still slide the jacket off over my watch this way. The outer is made of North Face’s Apex Bionic material. This material is a stretchy material that will (momentarily) repel water an is supposed to block wind. It is soft to the touch and is not plasticky feeling at all and it really does have a little stretch. I am happy with all of these features and I feel like these are the features that really make this a great jacket. I am contemplating adding an extra coat of DWR to the outside of the jacket though, just in case. This jacket will in fact be a great jacket for me considering where I live. Here in Mississippi the temperatures don’t really get much past the teens, so wearing this jacket with some layers underneath is plenty to keep me warm. Then of course if the temperatures really drop, I can pull out my winter coat. Also, along this same thought process, this will make a great jacket to hike in on day hikes when extra weight would not be a problem. And speaking of weight, this jacket weighs in at 26 oz (in XL). So, this is my jacket and even with the small annoyances, I am still very happy with it. Once I get the jacket out in the elements a little more I will be sure to post an update. Til then, thanks for reading.